Do you Believe in Gravity? Do you Trust the Pilot? is a solo performance by Thomas Hauert for which he wrote songs as a complement to the dance and the electronic music. The texts, dealing with the self and the limitations of one’s perspective, were explicitly inserted to create a particular context for interpretation of the dance movements. After three group pieces created with the other members of ZOO, Thomas Hauert decided to return to the solo format. 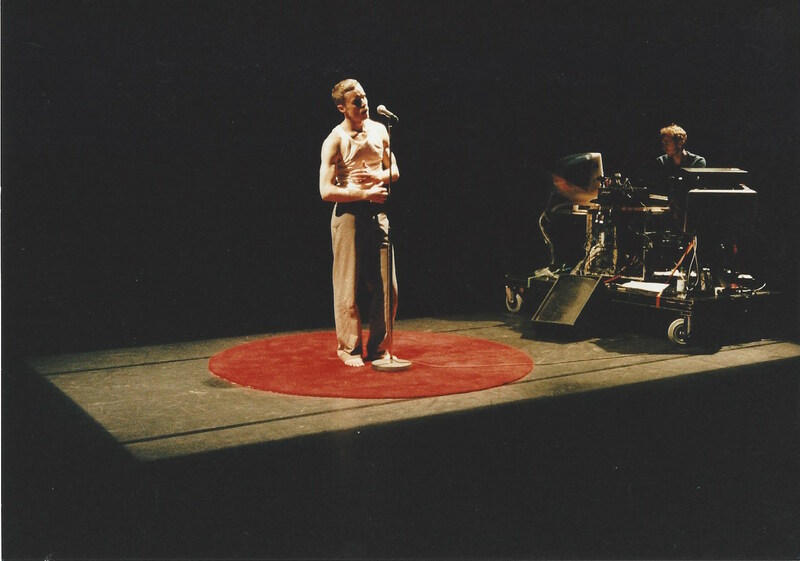 In his former performance Pop-Up Songbook, he had already used singing to explore the connection between movement and the voice. In this solo, particular attention goes to the ballads’ texts, written by Hauert himself. The solo has been chosen as a useful format for experimentation, but there are also other justifications for its use here, as the performance explores the connections between the individual and the world at large. The starting point is the circle, an enlarged dot, a circular entity which could represent the individual’s conscience. If a human being confines himself to the level of this conscience, however, he soon starts to go round in circles. There is no other solution than to leave the area and to launch out, either inwards – into the self – or outwards. Do You Believe in Gravity? Do You Trust the Pilot? is about that movement, the search for the self, communication and existential questions. It is about love, the fundamental part the others play in establishing our personal world view, the indispensable trust we have to put in them and our ensuing vulnerability. Hauert soon leaves the emotional level to explore the metaphysical domain: beyond scientific assumptions and clear-cut, binary logic he investigates concepts such as chance, intuition, creativity and volition. Actually, while developing these philosophical notions reminiscent of fuzzy logic, Hauert carries on, but at a different level, the investigation that led him to improvisation: how to bring about the unexpected, the unthinkable, that which can’t be conceptualised? In return the dance feeds upon a new understanding of its areas of meaning and of what’s at stake. Hauert steps out of the infinite number of possible walks of life to stand alone in front of the audience, sincere, generous and vulnerable. From his retreat, a red round rug, he invades the stage and gets into communication with Simon Siegmann’s bright set and Bart Aga’s electronic music, symbiotically developed with the text and movement, to present the audience with a fleeting glimpse through his private window on the world.